Visions single handedly stopped me topping myself after hearing Tulisa had hit the top spot last week with her awful debut single,We Are Young. 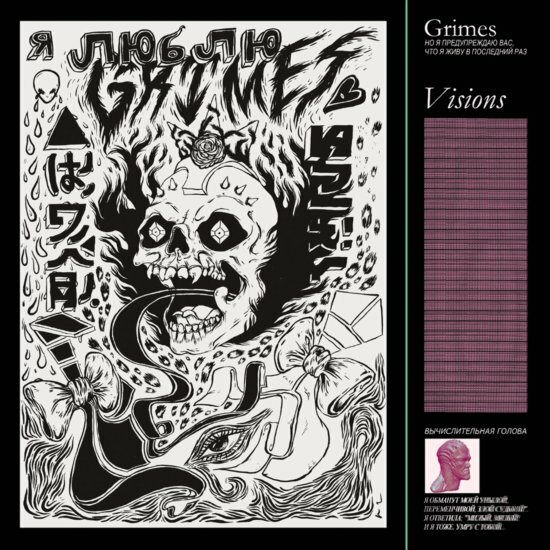 Despite having never heard of Grimes before, Visions is actually the 24 year old Canadians third album, so it seems like I'm late to the party. Grimes is that special kind of Diva, one whose creativity can almost literally be felt oozing out of the speakers. It was just what I needed to wash away the apathy and "woe-is-me" feelings I was starting to get from the overexposure of certain Divas and trends in current popular music. It is almost unbelievable to me that this was not only recorded in 3 weeks, but was entirely written and produced by the musician in her apartment. Set over the an enchanting and whimsical electronic soundscape, Grimes has created the most enticing, electronic music I have heard in a long time. Think part 80's B-movie soundtrack (Big Trouble In Little China), part new age goodness, and you pretty much have Visions in a nutshell. Despite the electronic, futuristic sound scape, there is something classical in the make up of this album, with Nightmusic's intro being the most blatant indicator of the star's wider influences. It's also showcased in the harmonies that Grimes' airy voice weaves in Symphonia IX (my wait is u); where they are stacked and arranged like that of Gregorian chants. It's a meshing of styles that works excitingly well. Though a vocal featherweight Grimes, uses her voice exceptionally. When its not layered to create subtly beautiful harmonies, its reaching into its box of tricks to accent and dance with the electronic make up of the song (listen out for the whistle notes in Circumambient, or the way her voice climbs in the beautifully soft Skin). These songs highlights the skill this young lady has not only as a musical producer but as a vocal arranger too. Grimes' Visions has been a breath of fresh air to me these last two weeks, and certainly joins Lana Del Rey's Born to Die on this Devotee of Divas list of albums of 2012. Truly inspiring in so many ways. Three weeks back on Jools ( the show with Jack White, Norah Jones, Alabama Shakes, The Chieftains) Grimes was the one act which I felt wasn't even close to the level of the rest of his guests.I found it quite boring. Didn't think she sucked or anything like that. I just felt that the only interesting thing was... she is doing alone what in the past was done by a band. But then, as evident from my opinion of the other guests of Jools, I would almost always rate acoustic as far more interesting than electronic. The only electronic music I ever truly loved was Faithless and Massive attack. I didn't hear anything new in Grimes' music. Didn't listen to the vids you posted though. lol i totally get what u mean about the big trouble in little china thing- this is brill sounds like what i was listening to a few weeks ago when my mood was meh too lol! Nice review - I'm obsessed with Grimes too! Symphonia IX is just the damn prettiest thing I've heard all year, and the variety of beats and textures on the album makes it absolutely mesmerizing to hear on a good pair of headphones. Anyway, I love seeing "alternative" divas covered on the site. I would love to hear your take on Beach House's Victoria Legrand. "Wild," "Troublemaker," and "Wishes" from their new album are her finest diva moments yet. and she's currently a lock for my personal (and highly coveted, I'm sure) Diva of the Year Award.